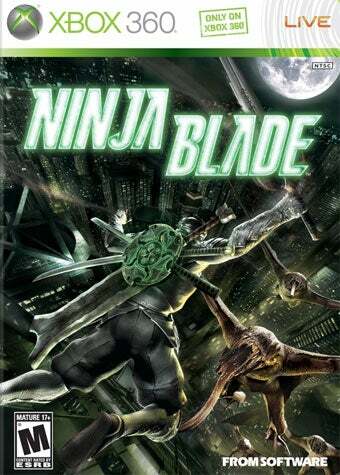 From Software's Ninja Blade gives Xbox 360 owning wannabe ninjas the opportunity to live vicariously—and cinematically—through protagonist Ken Ogawa, a super ninja tasked with saving futuristic Tokyo from parasite-infected Japanese schoolgirls, yakuza and salarymen. If Ninja Blade looks familiar, that's because it is so unapologetically derivative, borrowing game design elements wholesale from Japanese action-adventure titles like Ninja Gaiden, Devil May Cry and Onimusha. Ogawa can pull off killer combos, upgrade his weapons with harvested orbs—here called Blood Crystals—and topple foes of any size and shape. Even crab shaped! Like every other action game, Ninja Blade pits its hero against deadly, world-threatening demonic bad guys, from rank and file zombies... err... Carriers to gigantic, skyscraper hugging worms. Where Ninja Blade differs is in its heavy use of "Quick Time Events," the rapid reaction button presses that From Software hoped would make the game feel "cinematic," and its "Ninja Vision" gimmick, which slows down the action and lets Ogawa see what non-ninja can't. Does Ninja Blade flatter the games it imitates? Or is From Software's borrowing just an insult? Never, Ever A Dull Moment: Outside of some rather uninteresting cut scenes, the action in Ninja Blade never lets up. You're either fighting batches of low-level Carriers, engaged in a big boss battle, tapping out button presses, or manning a mounted machine gun. With very little in the way of exploration, players likely won't find the experience dull, as the game's pacing is carefully delivered. The ludicrous Quick Time Events ensure that anyone watching the game won't be bored either. Hilarious In Its Absurdity: We hate to spoil, but the game's rampant ridiculousness is noteworthy. Not only will Ninja Blade star Ken Ogawa ride a motorcycle down the side of a regurgitated bus in the sky, he'll use that motorcycle's gas tank as an explosive to finish off the giant worm that had just vomited it forth. Ogawa can also stop a runaway jetliner by himself, braking it with nothing more than the strength of his sword and powerful ninja feet. Ninja Blade is full of riotous attempts at cool that result in "WTF?" laugh out loud moments. Character Customization: Adding to the silliness of Ninja Blade are the game's unlockable outfits. If you're unsatisfied with standard ninja black, go fluorescent green, go leopard print, then edit your own color scheme. It makes the ride that much more insane. Constant Quick Time Events: If you even remotely dislike reflexive button jamming, you're going to despise Ninja Blade. From Software piles on the QTEs, even though they really don't have much of an impact. You can simply replay them over and over again until you get them right. With the exception of the stylish combo kills one can pull off for extra Blood Crystals during regular combat, the overused QTEs quickly become annoying. Ugly Aesthetics: While technically capable in the graphics department, Ninja Blade's art direction is horribly dated and unattractive. Everything's black, shiny, and lifeless, with sickly green lighting that feels like an imitation of the imitation of The Matrix. Enemy designs, while occasionally interesting, generally boil down to giant crustaceans and mutated insects. Ogawa himself looks dopey, exactly "how silly Ryu Hayabusa would look without the mouth piece of his ninja outfit" to quote Mike Fahey. Clunky Controls and Camera: Ninja Blade doesn't control nearly as well as the games it steals from, with a combat system that's just capable enough to get the job done. Ogawa bounces back and forth between enemies with little ninja grace, sliding toward his foes in a way that evokes flashbacks to Too Human and hacking away mindlessly. Camera issues can make wall running far less fun than it should be, resulting in unnecessary deaths and a general feeling that ninja aren't actually that cool. That camera can also make combat, especially when sprinting down the side of a skyscraper, annoyingly chaotic. Good thing button mashing works so well. Technical Problems: When the action gets heavy, Ninja Blade can suffer from some serious frame rate issues. Unfortunately, this is exactly when we need the game to behave at its technical best. My ten hours with Ninja Blade reminded me often of another game I'd recently played, 50 Cent: Blood on the Sand. Both are just-capable-enough action games that liberally swipe from titles of higher quality and better value. Both saturate the player in ludicrous conversations and far fetched situations. Both should only be played by gamers who have absorbed every ounce of gameplay from their forebears, because what's been done in Ninja Blade has been done better by games released in previous generations. Players will likely forget about Ken Ogawa and the events of Ninja Blade quickly, as the game doesn't offer particularly memorable mechanics—that "Ninja Vision" gimmick actually becomes a hindrance when used to exhaustion—nor does it introduce us to a likable hero. It does offer some spectacular motorcycle stunts though, making it worth watching when someone else is driving. Ninja Blade was developed by From Software and published by Microsoft Corp. for the Xbox 360, released on April 7th. Retails for $59.99 USD. Completed main campaign, spent way too much time customizing outfits.